Simplifying exploration and mining processes. Save time - deploy today, not in months. Focus on your project. Empower your team to work efficiently anywhere, with seamless field to office collaboration. Whether you’re a Senior Geologist or an Exploration Manager, CorePlan helps you budget, drill and streamline activities with speed and efficiency. From planning to completion. The collaboration platform for the project and your workforce. A single point of truth. No more email chains. Seamless integration with SharePoint and Microsoft office. The center of operations. Map your processes with CoreTrack, integrate data to drive decisions and resolve bottlenecks in real-time. 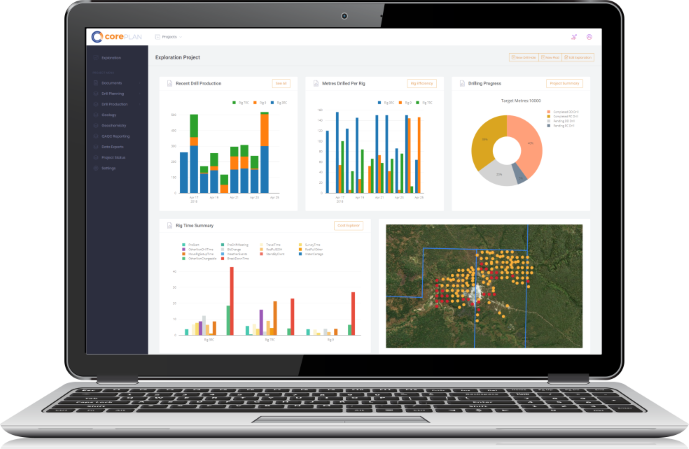 The analytics platform built for exploration and mining.